The cold moon or super moon last night (Dec 3rd) was at a point in its orbit or perigee at which it is closest to the earth. It can appear to be up to 14% larger and 30% brighter than usual. 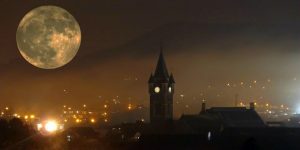 The image was taken when the moon was rising and the skies were overcast, but I was fortunate to get a 20 minute window space, and It is superimposed on a picture of the town clock in Neath to give the full effect of the moon’s size.